Queueing theory (QT) has been suggested to evaluate the effectiveness of MCI plans . This concept has been widely used to develop emergency department (ED) flow models to cope with ED crowding [4–6], but is rarely applied to MCIs. The theory, which includes assumptions on the probabilistic nature of the arrival at the queue, waiting in the queue, and serving the front of the queue, is a mathematical description of a queueing system. Based on QT theory, several measures of performance, including average waiting time in the queue or system, expected number waiting for or receiving service, and probability of encountering the system in certain states, could be derived. Application of this theory necessitates some trade-offs between the cost of service (providing health care) and the cost associated with waiting for that service (treatment delay). The ultimate goal of the concept is to achieve a balance between service in disaster events and ordinary clinical care. Therefore, queueing models may be used to make decisions that balance health care service (SRC) with MCI demand (surge capacity). QT usually contains only one node or station and can only manage uni-directional flow. Thus, the queueing network theory (QNT) was developed to solve the issue related to multiple stations. In this study, we utilize QT as mathematical models to allow system designers to calculate performance metrics (such as average queue length, average wait time, and the proportion of customers turned away) in health care operations . Previous studies mainly focus on the emergency cardiac ward, intensive care unit, entire hospital, or general operational research settings [16–21]. 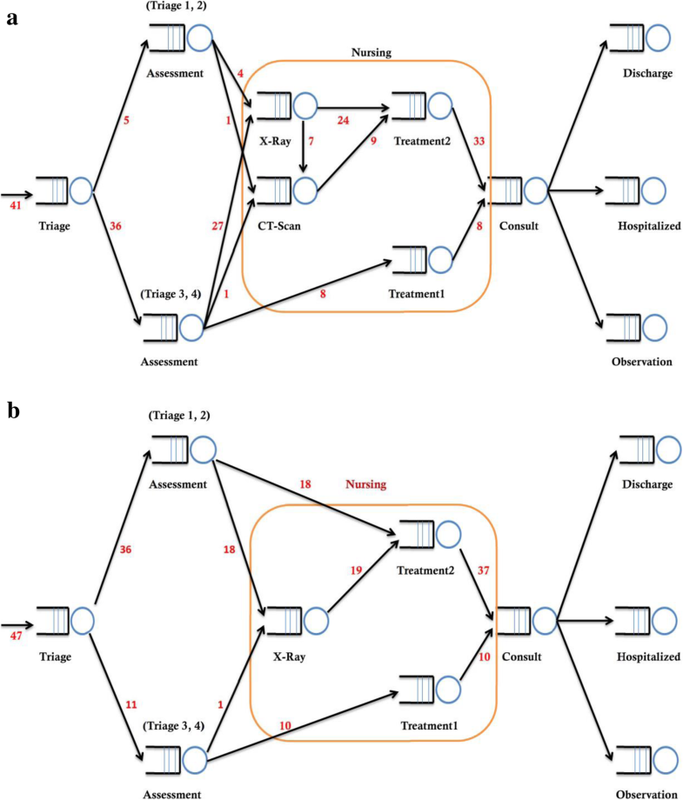 In this study, we applied queueing network to different kinds of MCIs to examine the degree of efficiency when handling these events. Using these models, we demonstrated how to use QT in evaluating patient arrival, efficient patient flow, length of stay, efficient patient outflow and physician and nursing manpower in two different kinds of MCIs. We believe that this study is the first to apply QT to evaluate the decision-making and effectiveness (optimal SRC) of different types of MCI management plans in the ED.